The attractive mat of leaves is silvery gray and woolly. 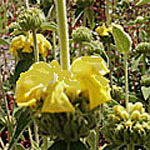 The tall flower stalks are covered with whorls of bright yellow blossoms. Does well in poor, dry soils once established. Great hummingbird plant for tough places. Seed heads are nice in dried floral designs. Categories: All Items, all potted plants, deer resistant, dried flowers, hummingbird plants, Potted Plants, More..